There is something on the lakes for everyone. A villa rental on the Italian lakes provides a very welcome change of pace and scenery that makes for a very satisfying holiday. 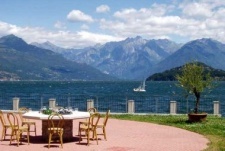 Italy has several lakes with villa rentals available, and each has its own personality and character. Lake Garda is the largest lake in Italy. It's in the area between Venice and Milan, so it offers access to the charming towns of the Veneto on one side and the shopping and tourist areas of Lombardy on the other. 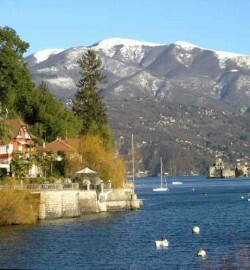 Lake Como is probably the most active and lively of the lakes, offering a thriving southern area as well as a scenic and engaging central lake. Lake Como is shaped like an inverted letter Y, with the busy towns of Como and Cernobbio near the bottom, and the popular destinations of Menaggio, Bellagio and Varenna in the middle. Lake Maggiore has a friendly and unassuming personality that offers a very warm and accommodating atmosphere to the visitor. Take a boat ride from Stresa out to the islands and forget about time. Finally, there is the poetic cousin, Lake Orta, which quietly invites you to explore and experience your artistic side. Set up your easel by the shore in the village of Orta San Giulio and paint the alluring island of Isola San Giulio in the distance. Look for an Italian lakes villa rental or apartment - Enter your travel dates and preferences and select one or more lakes to search. Send us an inquiry or reservation request when you find properties you like. Want some assistance from our Italy lakes specialists?